Bedtime doesn't have to be a chore, especially with Flexa Mid Sleeper Beds, available in a range of vibrant colours that are sure to brighten up your child's night time routine. Each fantastic mid sleeper offers a small, durable white coated MDF bed frame with a central, three stepped ladder leading to a comfortable bed that's the perfect size for children. 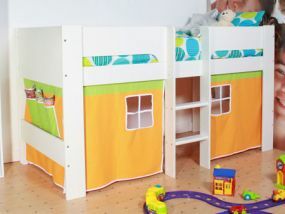 Beneath the bed, there is a feature play tent, designed to make bedtimes a bit more desirable for your little ones. 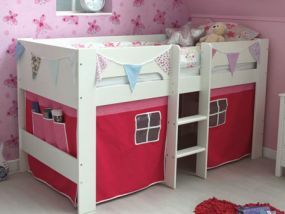 Each bed is finished off with a different colour theme - available in lime green and orange or bright fuchsia and pink - so you will always be able to find a Flexa Mid Sleeper Bed to suit your child's interests or bedroom decor. With free delivery on your affordable and fun Flexa Mid Sleeper, both children and adults are guaranteed to be satisfied and happy when it comes to bedtime with one of these at home.